LAPregnancy loves L.A. Rocking Chair Store!! Walk on into this store and you will be greeted by as he calls himself, "The KING of Rocking Chairs!" And, well... Robert Loscalzo is King!! Based on the trendy street of La Brea in the heart of L.A. "hipsters," L.A. Rocking Chair store is where it's at! Filled with the best selection of rocking chairs in the country, Robert will find you a great price with service extraordinaire. 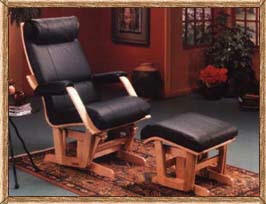 From gliders for the mom-to-be or baby chairs for the little ones, Robert has it all! L.A. Rocking Store also works with all the area local hospitals providing consultations and rocking chairs for their maternity wards. And here's the kicker... if you're baby comes early, Robert will provide you with a loaner for free if you're in the Los Angeles area. What else can we say about L.A. Rocking Chair Store but they're not only the sweetest to work with but the best! 304 S. La Brea Av.